Campbell Scientific and Geo-Watersheds Scientific are research partners with the Cold Climate Housing Research Center (CCHRC). The CCHRC is a nonprofit research and testing organization that promotes healthy, durable, energy-efficient, affordable homes, along with building products and designs for cold climates. The foundation system was built to allow future releveling in case of degradation of underlying permafrost. Jacking pads under the foundations are used to adjust the concrete beams that support the building walls and lower-level floor system. 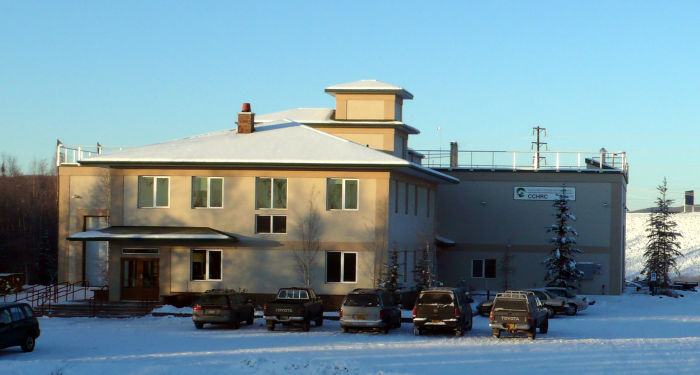 Various floor and foundation types were used in the construction of the building so that different temperature-profile sections could be monitored for thermal analysis of the building heat flow to underlying permafrost. The numerous thermistors and CS616 soil moisture probes are handled by Campbell AM16/32A multiplexers that expand the capacity of the CR10X and CR1000 dataloggers’ input channels. In addition to studying foundation systems, the CCHRC expends major effort researching building envelopes, energy systems, and green roofs at the RTF. The data collected for this project will be used for operations, education, and research. For more information on this project, visit www.cchrc.org. Michael Lilly, Geo-Watersheds Scientific; Ron Paetzold, Geo-Watersheds Scientific; Austin McHugh, Campbell Scientific, Inc.